Tag line: "Blood lost. Life found." I guess it’s safe to say that, with 2014’s Birdman or (The Unexpected Virtue of Ignorance) and 2015’s The Revenant, director Alejandro González Iñárritu is on a roll. Both movies won multiple Academy Awards and netted Iñárritu back-to-back Best Director Oscars, making him the first person to pull this off since Joseph L. Mankiewicz (who took home statuettes for both 1949’s A Letter to Three Wives and 1950’s All About Eve). But what makes Birdman and The Revenant so special is their unique style, which Iñárritu injects into practically every scene, resulting in a pair of motion pictures that will surely stand the test of time. The year is 1823, and Hugh Glass (Leonardo DiCaprio) is guiding a band of fur trappers, led by Capt. Andrew Henry (Domhnall Gleeson), through the untamed wilderness. When an Indian attack leaves their party decimated, Glass, Capt. Henry, and a handful of others, including fellow trapper John Fitzgerald (Tom Hardy) and Glass’s one-half Native American son Hawk (Forrest Goodluck), climb aboard a boat and float down the river. Fearing more Natives may be lying in wait, Glass suggests that they get off the boat as soon as possible. Fitzgerald disagrees, saying they should remain on board where it’s safe, but Capt. Henry takes Glass’s advice, and orders the men to set up camp once they’re on dry land. The next day, while out doing some reconnaissance, Glass is attacked and nearly mauled to death by a grizzly bear. At first, Capt. Henry orders the men to carry Glass (who’s laid out on a makeshift stretcher), but when it proves too difficult to do so, he promises a $100 bonus to anyone who volunteers to stay behind with Glass and tend to his wounds. Both Hawk and a young man named Jim Bridger (Will Poulter) volunteer immediately, and offer to give their $100 to whoever joins them. Hoping to make back the money he lost on the pelts, the belligerent Fitzgerald agrees to stay, vowing to give Glass a proper burial when the time comes (like most men, Fitzgerald is convinced Glass will be dead within a day). But Glass doesn’t die, and Fitzgerald, anxious to make his way back to Fort Kiowa, decides to end Glass’s suffering once and for all. When Hawk tries to stop him, a fight ensues, during which Fitzgerald stabs the young native American, killing him almost instantly. After hiding the body, Fitzgerald tricks Bridger (who had gone for water) into thinking that Hawk wandered off, and later tells the young man that a band of hostile Natives is nearby, and that they should leave Glass behind and save themselves. 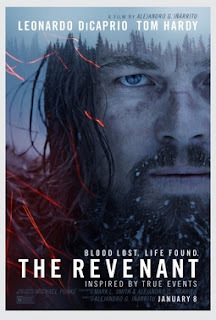 Thus begins Hugh Glass’s struggle, pitting his will to survive against both the elements and his debilitating injuries, all in an attempt to make it back to civilization and exact his revenge on the man who just killed his son. Shot on-location in both Canada and the Northern United States, often in freezing cold temperatures, The Revenant takes advantage of its harsh settings, using them to great effect to relate what at first looks like a hopeless tale of survival (even in a more temperate area, the odds would have been against Glass; in driving snow and the bitter cold, his quest seems damn near impossible). Along with the surroundings, director Iñárritu and his cinematographer Emmanuel Lubezki (who has won three Oscars in a row, for Gravity, Birdman, and this film) utilize a number of long, uninterrupted shots that succeed in drawing the audience directly into the action. We get a taste of this early on, during the initial melee that forces the trappers to flee their camp. As the arrows fly and the bodies fall, the camera moves freely through the chaos, showing us a great deal of the ensuing carnage as we follow the trappers to the boat that will take them to safety. It’s a grisly, violent scene that, thanks to the way it’s presented, is also completely invigorating. More moments like this will follow (including the bear attack and a chase scene, where Glass, on horseback, tries to outrun some hostile natives), each as amazing as the last. Leonardo DiCaprio won a well-deserved Academy Award for The Revenant (his character barely speaks through most of the film, yet not a moment goes by where we don’t feel Hugh Glass’s pain). Equally as impressive as the film’s star, though, was the performance by Tom Hardy as Fitzgerald, who, while admittedly deceitful, isn’t your typical movie villain (he’s just a guy trying to earn a living any way he can). Together, DiCaprio and Hardy deliver a hell of a one-two punch, and it’s a damn shame they didn’t both walk off with an Oscar (not to take anything away from Mark Rylance, the winner of this year’s Academy Award for Best Supporting Actor, who was indeed wonderful as the Russian agent in Spielberg’s Bridge of Spies. But if I had a vote, it would have gone to Hardy). An often jaw-dropping cinematic achievement, The Revenant is, like Birdman before it, a stunning piece of work, and I can’t wait to see what Iñárritu comes up with next! Reminds me of a moie I saw once with Richard Harris, "Man In The Wilderness"